Here at Gearfuse, we love seeing all the cool Steampunk twists people put on regular products. Sadly, this awesome set of Steampunk headphones that you see pictured above is actually just a non-functional model. A guy from Chicago who calls himself Nicrosin made this “Mechanical Aural Communication Device” as a prop with “sculpey, rubber, and… various pocket watch parts,” the earpieces have a suede lining. 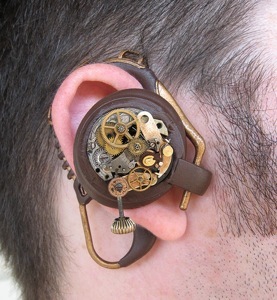 Real Steampunk headphones that look like the inside of a watch would be awesome. Hopefully, someone will take a cue from Nicrosin’s idea and make a working version of these. They are for a plantronics phone set, but they are functional and stylish. One could actually design these styles around a functioning blue tooth headset. If one were inclined to spend the money and time.